Native American Style Drone Flutes made from Birds Eye Maple. You can bring your own accompaniment with you. Either play as a double or as a single. Wonderfully haunting sound. Created from Bird's Eye Maple, which grows in the northern US and Canada. I read somewhere that the trees that get less sunshine are more likely to have this kind of figure. Bird's Eye Maple is scarce. Most of the logs are bought up by the veneer makers, so lumber is hard to find and expensive. However, I feel that it makes for beautiful instruments. The Maple is hard and gives a good tone. I make these flutes in plain and inlaid versions. The top photo is of an F#m Double Inlaid Drone. The bottom photo is of a Dm Drone without inlay. I am making them more in the shape of the bottom flute now. The Dm is big, but the Gm, F#m and Em are not quite as bulky. They're much more svelte. 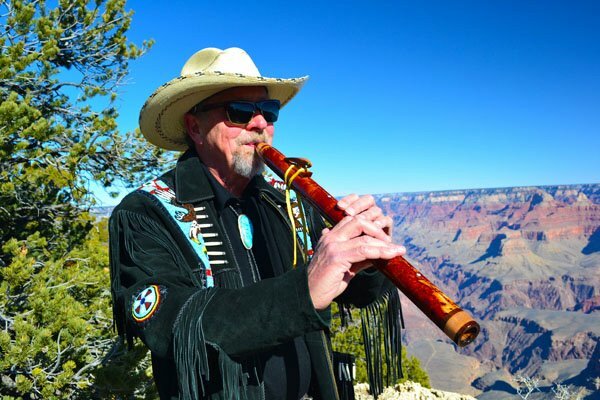 You can play this flute as a single flute or by simply moving your lips over the second hole, you can add accompaniment to your own playing. The drone side plays the fundamental, or the low note of the scale. If one over blows just right, the drone side can jump up an octave, so you can have either a high note or a low note to accompany your melodies. I have designed the mouthpiece so that it's easy to play the melody side alone without having to worry about accidentally playing the drone side when accompaniment is not desired. This mouthpiece is very comfortable for most players, but if you want it flat, just let me know and I'll make it that way. 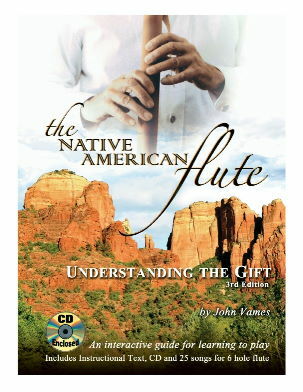 If you're interested in either getting started on the right foot with the Native American flute or feel you want to learn more about playing techniques, you might want to check out "Understanding the Gift" by John Vames. Please check out the measurements below to make sure your choice will fit your hands. List of different keyed flutes and their average sizes for Laughing Crow Drone flutes. These sizes are all average. The hole spacing and hole sizes are the maximum used. Some holes are a bit smaller and some hole spacings are slightly larger than what is listed. It's up to you to decide if your hands can fit these flutes. The lower pitches are bigger and longer. It's a matter of physics. I understand that lots of folks want the lower pitches, but if you want lower, it's going to be bigger. The list starts at the higher pitches and goes lower as you go down the list. I hope this helps you determine the size that you can handle. Am Drones - Length=21" Distance to furthest hole=15 3/4" Hole Spacing=1" (farthest two holes) Hole Size=3/8" Width=2 3/4" Thickness=1 1/2"
Gm Drones - Length=22" Distance to furthest hole=16 1/2" Hole Spacing=1 3/4" (farthest two holes) Hole Size=3/8" Width=2 3/4" Thickness=1 1/2"
F#m Drones -Length=24" Distance to furthest hole=18 1/2" Hole Spacing=1 3/4" (farthest two holes) Hole Size=3/8" Width=2 3/4" Thickness=1 1/2"
Em Drones - (The size that can be difficult for some hands.) Length=26" Distance to furthest hole=18 1/2" Hole Spacing=1 3/4" (farthest two holes) Hole Size=3/8" Width=2 3/4" Thickness=1 1/2"
Add a Maple Burl Eagle Fetish to Any Laughing Crow Flute. 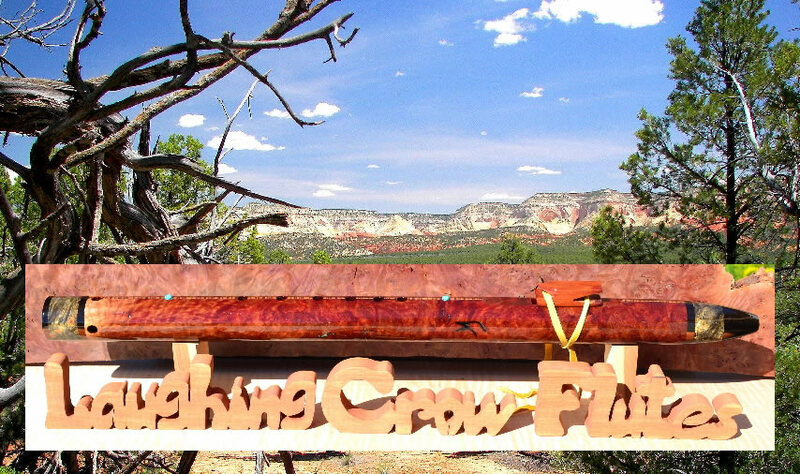 Add a Cedar Eagle Fetish to Any Laughing Crow Flute.